"The strong flavors in this dish are very satisfying. Always a family hit. Ground beef or ground chicken can easily be substituted for the turkey." Heat the olive oil in a skillet over medium heat; cook the onion and bell pepper in the hot oil until they begin to soften, about 5 minutes. Add the garlic and ground turkey to the skillet; cook and stir until the turkey is completely crumbled and browned, another 5 to 7 minutes. Stir the pureed tomatoes, barbeque sauce, ketchup, vinegar, Worcestershire sauce, mustard, and chile-garlic sauce into the turkey mixture. Simmer until completely heated, 7 to 10 minutes more. I made a few changes like diced zuchinni instead of green pepper and yellow mustard instead of brown. I will add more salt next time because it definetly needs some. a good base recipe. I did add 2 tbsp of tomato paste to thicken up the meat mixture but minor alteration. Ths was a very good sloppy joe. I omitted the ketchup and added a few tbsp brown sugar. I liked the mustard and chile-garlic sauce as well. Definatly worth a try! 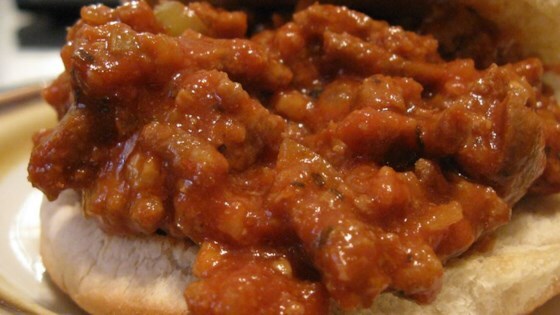 I made this exactly as indicated and, for a sloppy joe recipe, this is a great one. The consistency was perfect and the spice was a nice change from the usual recipe.